The 2014 World Cup is in the knock-out stage, and the competition is slated to heat up. 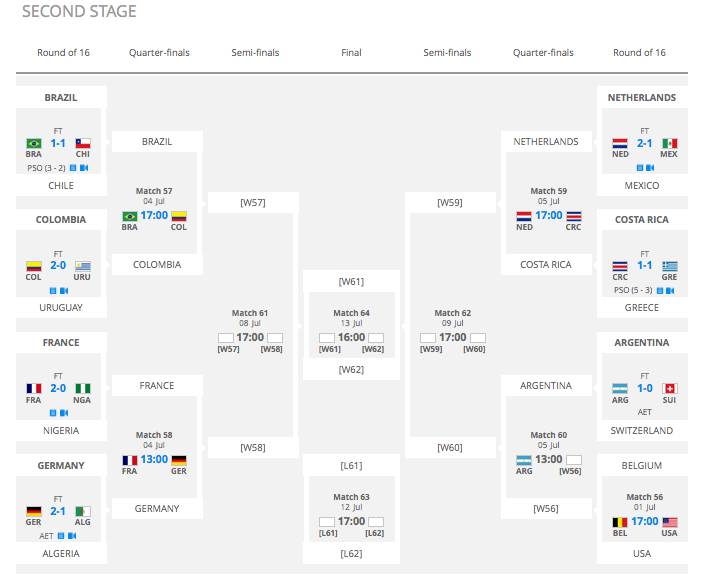 Check out the bracket for the round of 16 below. All times are in Eastern Daylight Time. 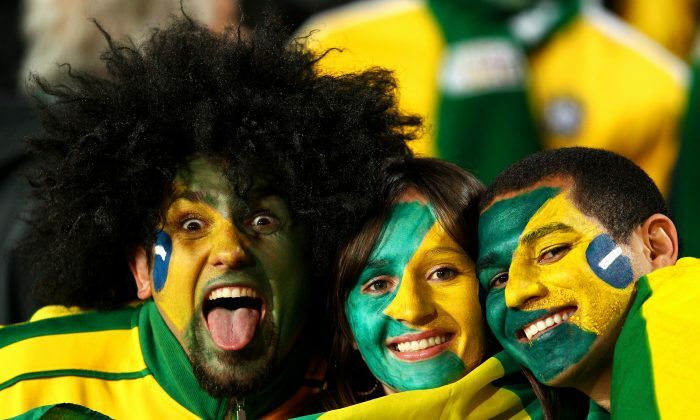 Prediction: Chile have good forwards in Alexis Sanchez and Eduardo Vargas, but Brazil have Neymar and the home crowd. 2-1 to Brazil. Prediction: Colombia’s James Rodríguez is in excellent form, and the team are clicking well. Uruguay on the other hand are missing Luis Suarez through suspension, and have not played well without him. 2-0 to Colombia. Prediction: Can Robin van Persie, Arjen Robben, and Wesley Sneijder find anything past in-form goalie Guillermo Ochoa and a stingy Mexican defense? And will Javier Hernández and Giovani dos Santos show up find holes in the 5-man Netherlands defense? 1-1 draw, Netherlands to advance through penalties. Prediction: Costa Rica have impressed at the World Cup so far as a team with excellent results against Uruguay and England. Greece barely scrapped through Group C. Costa Rica to win 3-0. Prediction: France are firing on all cylinders in the World Cup, while Nigeria are struggling for consistency. The absence of Mamadou Sakho and Raphael Varane might makes things tricky at the back for Les Bleus though. 4-2 to France. Prediction: Algeria will want to extract revenge from Germany for their 1982 exit, but Germany look too strong at the moment to allow that. 3-1 to Germany. Prediction: Tough one to call. Argentina are just not clicking, yet they have enough individual talent in Lionel Messi, Gonzalo Higuaín, Angel di María, and Ezequiel Lavezzi to pull them out of tough spots. The Swiss are tough and organized, and their front pair of Xherdan Shaqiri and Josip Drmic are combining beautifully. 2-1 to Switzerland. Prediction: Belgium have a “golden generation,” but have not impressed against supposedly “weaker” opponents so far. The United States, on the other hand, are proving more than a sum of their parts, and have gained the knack of grinding out results. USA to win 1-0.